CD – STILL AVAILABLE! I’ve collected fifteen of my welcome/justice-themed hymn texts and put them on a CD. Iowa City-based singer-song writer Sara Kay has recorded the vocals–and they’re gorgeous! Released in July 2013, here’s my blog post announcing the project (note that my Kickstarter campaign is over — and it was a resounding success). An 8-page pdf with the lyrics for all the hymns on the album set on as a series of 8.5×11 half-sheets is here. A smaller 2-page pdf with all the lyrics down-sized to fit front/back on a single sheet of 8.5×14 paper is here. Digital download via CD Baby here. “David Weiss and Sara Kay’s intention is clear: to seed the church with grace. David’s ministry of celebrating people of all orientations comes through loud and clear in his texts. Consider this recording a demo for your congregation’s leaders as they lead open-hearted worship.” ~ Richard Bruxvoort Colligan, Musician & Liturgical Theologian, Author & Composer for The Psalm Project. Selected for use in the University of Wisconsin System Institute on Race & Ethnicity, Campus Reading Seminar, 2010-2011. A timely collection of essays and hymns eloquently calling for a Christian faith that extends an affirming welcome to gay, lesbian, bisexual, transgender, and queer persons. I sold about 3000 copies of the book from 2008-2018. The book is now out of print and I have no copies left. I continue to write and speak around spirituality, sexuality, and the wideness of God’s welcome. To the Tune of a Welcoming God, by poet, theologian, essayist, and activist David Weiss, explores the divisive questions of whether and how the church might welcome the GLBT Christians at its doorstep—and already in its pews. Writing with academic training, prophetic passion, and poetic insight, Weiss invites readers to revisit these questions through poems, essays, and hymns that are at once engaging and provocative. While rooted deeply in his own Lutheran context, Weiss’s words reach far beyond, challenging, encouraging, and empowering persons regardless of their particular tradition. Teachers, students, pastors, and laypersons—whether gay or straight—will find these short texts worthy of long reflection and conversation. GLBT Christians will be empowered to speak with renewed dignity and conviction about their place in the church. Pastors will be empowered to bring this issue more productively into parish conversation. And straight persons, both allies and inquirers, will be empowered to consider the place of GLBT Christians in the church more thoughtfully and to act on their convictions with greater confidence. Pastor Anita Hill, in her foreword, calls this book a “graceful force,” its words “shockingly beautiful.” For those whose own heart and mind have already been captivated by the tune of a welcoming God, these readings will help put clear words and images to the music already at play in their lives. At times whimsical, sobering, challenging, surprising, insightful, and subversive, To the Tune of a Welcoming God invites the church to sing a new song. 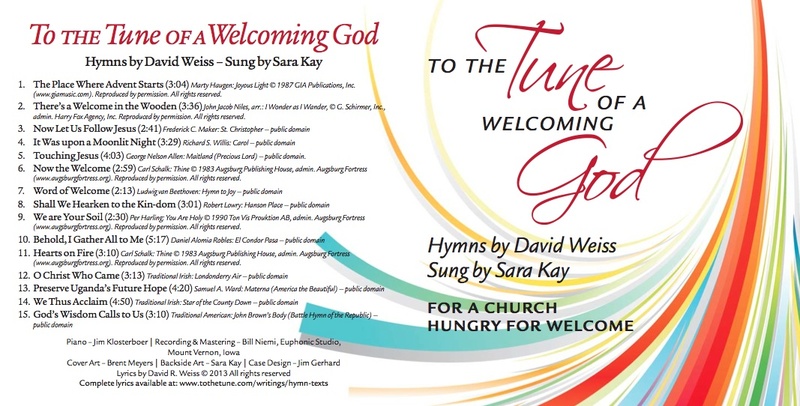 To the Tune of a Welcoming God was published in partnership with Wingspan Ministry of St. Paul-Reformation Lutheran Church, Saint Paul, Minnesota. 25% of the profits from the sale of the book went to Wingspan Ministry (no longer active). For more than twenty years Wingspan Ministry, a congregational ministry of St. Paul-Reformation Lutheran Church, provided pastoral care, educational resources, and prophetic advocacy for gay, lesbian, bisexual, and transgender people. It provided key leadership in St. Paul-Reformation’s journey to ordain Pastor Anita Hill in 2001. Later on, through resources like this book, Wingspan continued its work toward the full inclusion and affirmation of GLBT persons in faith communities, most especially in the Evangelical Lutheran Church in America. As a congregational ministry driven by church members Wingspan helped St. Paul-Reformation Lutheran Church model a new way of being church that seeks to include all persons. I call the writings “lyrical” because, quite beyond the lyrics in the hymns, I write with a poet’s sensitivity to the way juxtaposed images can bring insight and the way language, well-used, can lure us toward truth and understanding. My writing tries to put words to the “music of welcome” that I hear in my heart. The Rev. Rebecca Voelkel, who directs the Institute for Welcoming Resources of the National Gay & Lesbian Task Force, says of my book: “Theological clarity meets poetic grace. In our work for a more just and extravagantly welcoming Church, there is no stronger ally and friend than David Weiss and no more artistic work than his.” I’m grateful for her words of praise (you can find more praise for the book here) but I write less for praise than for justice. Though, as a poet, I do believe the justice is beautiful. And I hope that the eloquence of my writings opens hearts and minds to the goodness and the justice for which we were made. You can also download an excerpt to sample my writing. Note: there is now a limited number of these books left. As of June 2013 it went officially “out of print” with the publisher. You can’t get it on Amazon or through a bookstore any longer. But I have the remaining inventory and will sell them for as long as supplies last.